When many of us think about financial statement analysis, we think about looking at a company’s balance sheet in order to try and make a sound investment decision. However, financial statement analysis doesn’t just have to be about understanding the profitability of a company, or the risk that the company has. 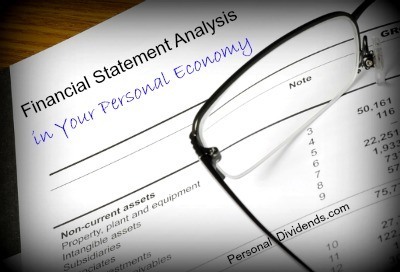 You can also use a similar process to analyze your personal economy, taking note of your cash flow. The process with your personal finances won’t be as involved as a true financial statement analysis of a company, but a simplified version can be very telling, and help you get on the right financial track. In the first stage of financials statement analysis, the balance sheet information is presented in a way that groups different items together. With a business, this might indicate “normal” earnings from regular sources, as well as occasional earnings. The same is true of grouping liabilities. In a business, net operating costs are grouped together, and financial debt is grouped in another way. This works with your own personal finances as well. You can group your own income and debt in a similar fashion. You can also include your expenses. Break down your own financial statement into regular income and variable income, monthly expenses and occasional expenses. If you have debt, group that together as well, separating out the consumer debt from other types of debt. When you look at your money in this way, you can get a big picture idea of what your financial situation is right now. You can quickly see what income you can rely on, and what income might not be there next month. Another part of financial statement analysis is creating ratios to get an idea of risk. You can use ratios to determine how much profitability a company is experiencing, as well as the amount of risk presented by its debt load. The same principle can apply to your personal finances, too. Look at how much debt you have, and then look at it as a percentage of your income. How is your debt affecting your net worth? Are you at risk of succumbing? You can also look at your return on capital in this way. How are your investments doing? Are you reaching your goals? Could you more efficiently be putting some of your financial resources elsewhere? There’s a lot that can be learned when you get right down to it. When you take your personal finances and look at your inflows and outflows, as well as the use you are making of your capital, you can get a much better idea of where you stand financially. Plus, putting it all in stark business terms can really help you see where you need to improve. Take the time to make a financial statement of your finances, and then break it down using a simplified form of financial statement analysis. You’ll have a new way to look at your money and maybe even see how you can improve. I like the ratio idea. I think this could be a good way to track personal debt burden and motivate debtors to pay off debt. Ratios could also indicate when a debtor is approaching the danger zone of cash flow being inadequate to service debt.